A film wherein 15 figures individually take on the roles of a traditional film crew on set of a fictional student production. A distant, static camera fills the frame with their movements and interactions as they prepare for the shooting of a scene. The film begins the moment director, Harkeerat Mangat, calls, “action” from behind the camera, and concludes, after a series of conflicts, malfunctions and complications among crew members on set when acting director, Derek Coulombe calls “action” on screen. Prior to the filming of Action, each individual acting as crew member was given a separate list of specific actions that were to be carried out before the end of the film. Individuals involved were unaware that their actions were devised for the purpose of colliding with the actions of others and creating dramatic situations among characters. Action, a structured film that was shot on one continuous take without rehearsal, conveys its fictional plot in an organic, realistic manner. 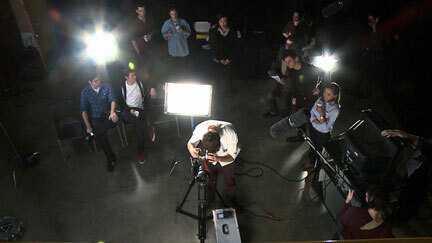 The film gives audiences a director's outlook as he observes his actors and provides a critical, humorous critique on the nature of film production.